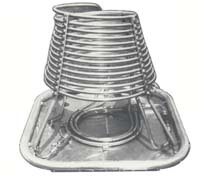 burner [now gimbaled], and load cable attachments at base of uprights). never content to run with the pack. Avian is an American maker that can be compared to a microbrewed beer - not mass-produced, not geared for popular whims, just a solid product whose devotees will fly nothing else. 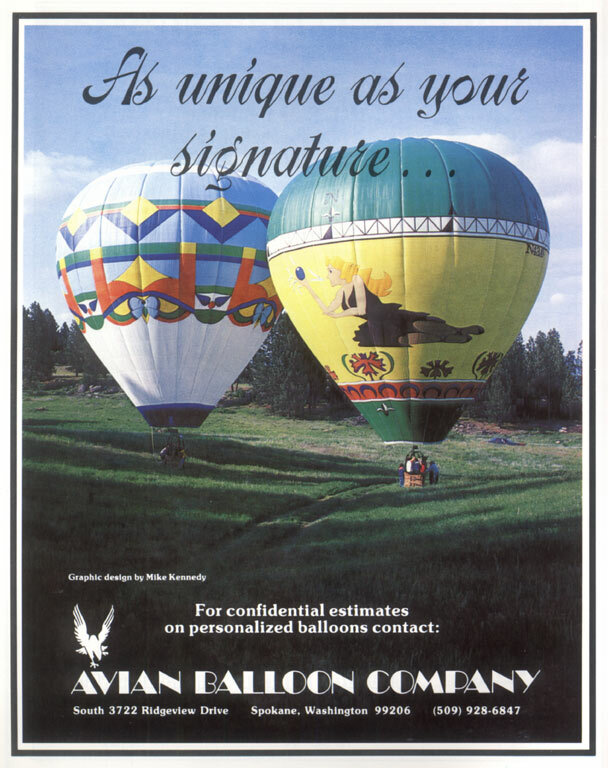 Part of the appeal of Avians has always been the company's focus on innovation that does not dilute its adherence to tradition. 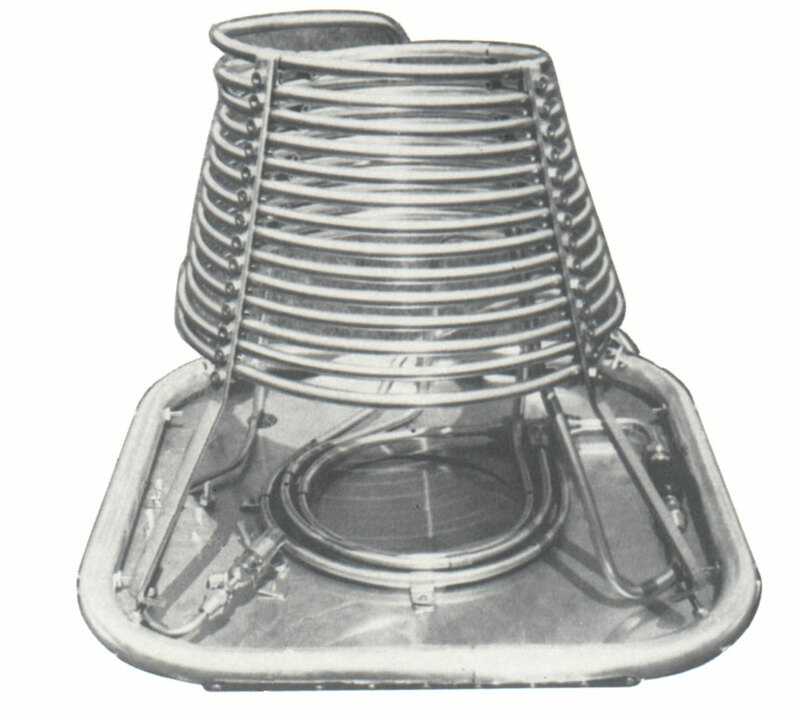 This dichotomy is illustrated in the patent issued to Avian founder Forey Walter in 1976. Because of the importance of this patent to the development of Avian balloons, I've created a page documenting the patent application (click here). Despite the incredible detail in the patent, I still have relatively little information on Avian and its products. 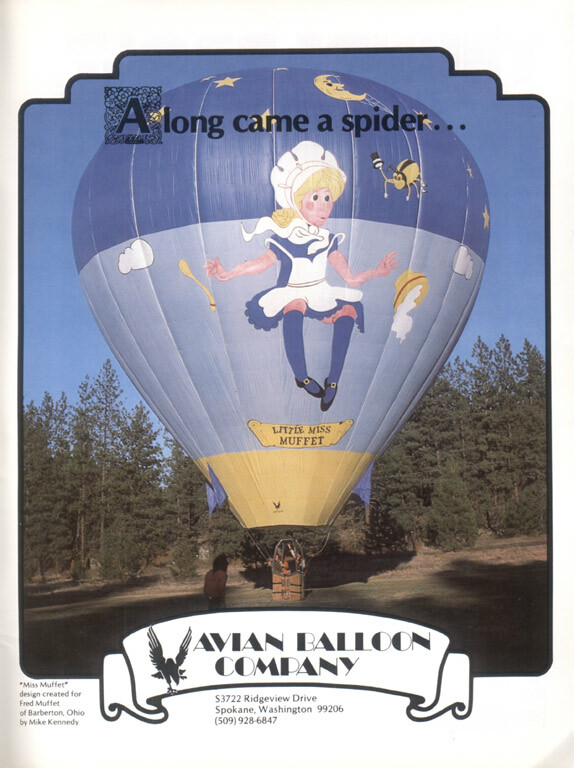 Avian fans - please write me with more information on these one-of-a-kind balloons! 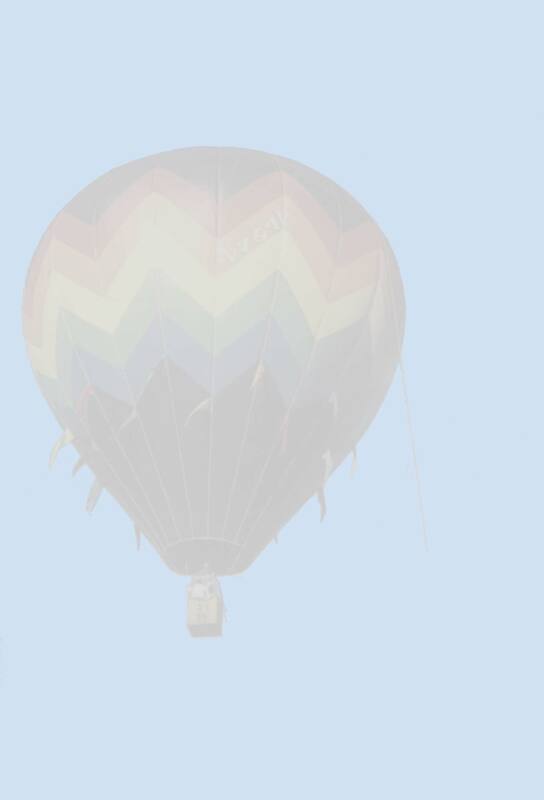 Click on any of the images below to open a new window with a MUCH larger version. Some files are over 300KB, so downloads may take a while.
" 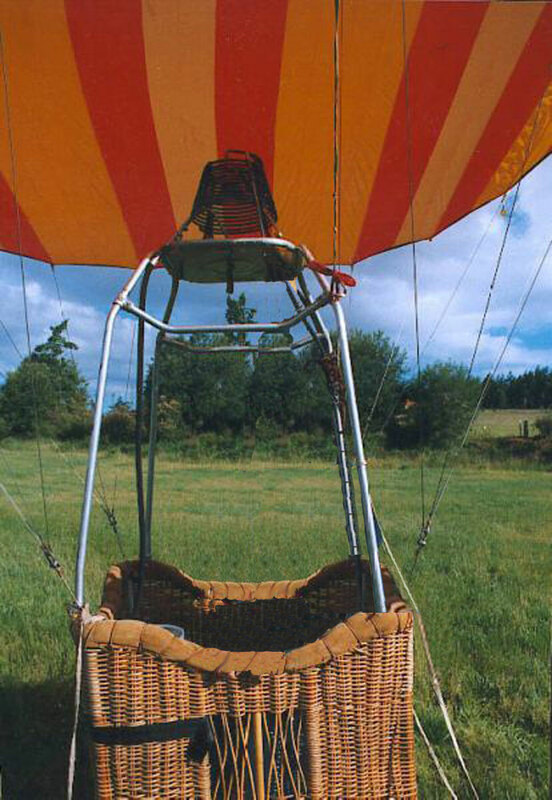 ¤ " symbol indicates photo scanned with permission from BALLOONING magazine and the BFA. Avians are quite smooth-gored, with straight sides, for a somewhat triangular profile. 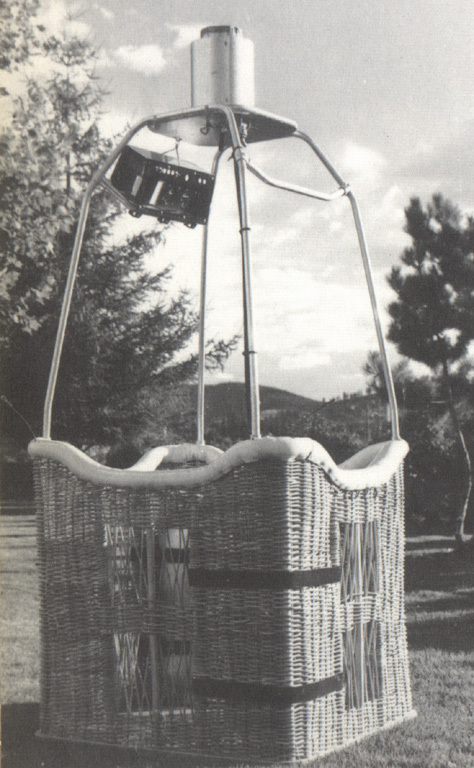 An early Avian basket, much like later models, but with horizontal weave and "chimney" burner design. 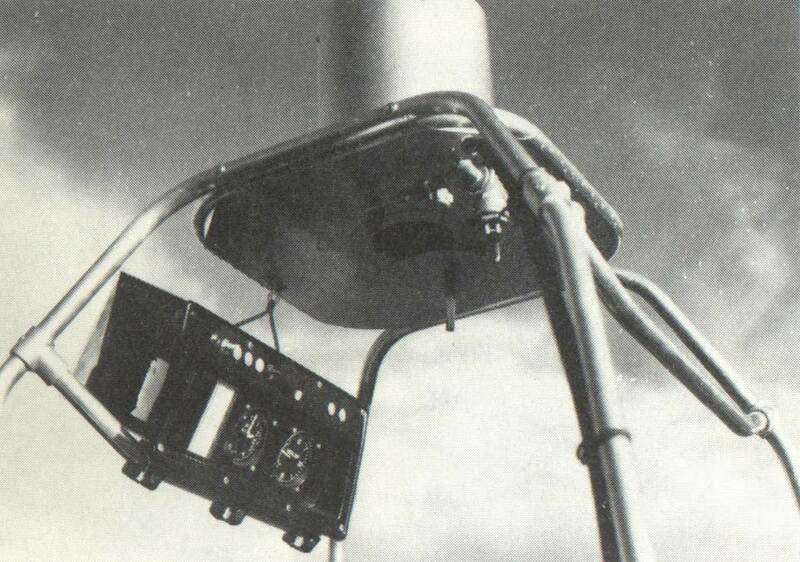 By the late '70s, Avian was purveying a much more modern burner, although still not gimbaled or otherwise maneuverable independent of the gondola. A better look at the early Avian burner. Another shot of the super-smooth Avian envelope. 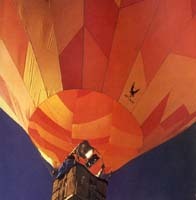 Avians create a unique atmosphere underneath the envelope - nothing else is proportioned quite the same. Right at the turn-of-the-'80s, Avian expanded its range of envelope patterns, as evidenced by this unpaid writeup in Ballooning magazine. 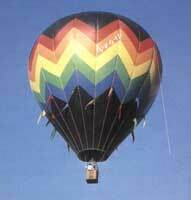 At the same time, Avian introduced a parachute top, almost reluctantly joining the crowd in adopting Tracy Barnes' greatest innovation. 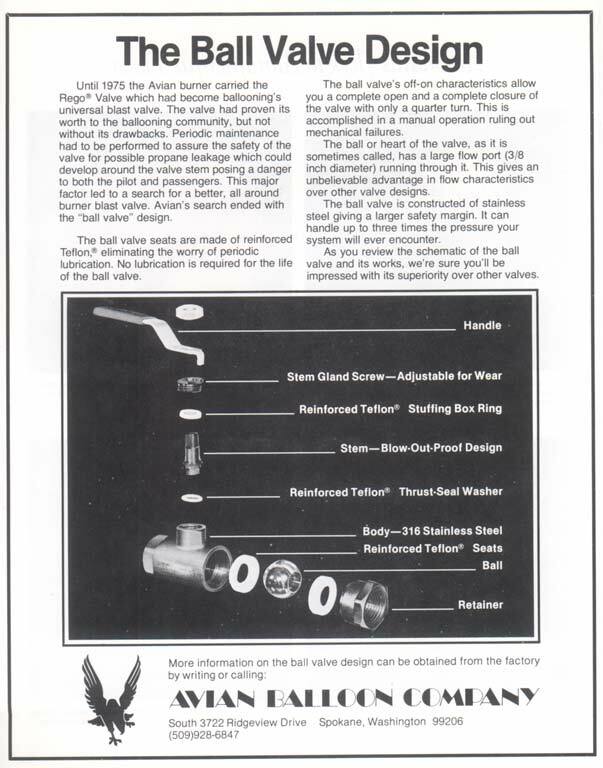 Anyone who expects some technical detail in a balloon advertisement will be more than satisfied with this '79 comparison of Avian's ball-type blast valve with the ubiquitous Rego. 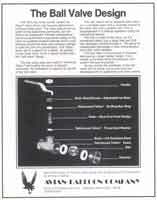 Avian made a series of magazine ads to show off how nicely their flat envelope displayed graphics. This one's from '80. 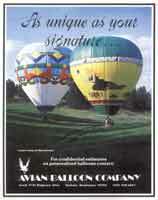 Another ad demonstrating the Avian envelope's effectiveness as a canvas for large-scale art, this one from 1979. Extra-special thanks to Lance Terry, for the loan of his '78-'81 Ballooning magazines, and to Glen Moyer, for the generous permission to reproduce images from Ballooning.